I am deeply touched by the love and affection people shower on me. A reader got me a bag of dried blueberries from US, when she came to India. I was deeply touched by her gesture. Since I do not get fresh blueberries in my place, I have used the dry blueberries she got to make these Low Fat Moist Blueberry Whole Wheat Bran Muffins. Stay tuned for more blueberry recipes. I adapted the recipe from here and made changes to suit my preferences. These low fat bran muffins are healthy, easy to make and can be had for breakfast. 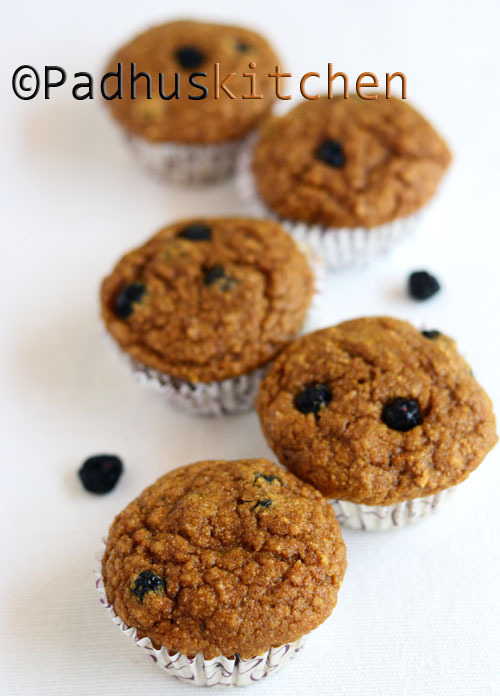 Today we will learn how to make wheat bran blueberry muffins following this easy recipe with step wise pictures. Pre heat oven at 180 degree C for 10 minutes. Sieve together whole wheat flour, baking powder, baking soda and salt together. Keep the flour mixture aside. Beat egg lightly and keep it aside. Grease muffin cups or line muffin cup with paper muffin liners. How to make apple sauce - Peel the apples and core them. Cut it into cubes. Add just enough water to cover the apples and cook them. Once the apples are soft, switch off the heat. When it is warm, drain the water if any and blend it to a puree. Your apple sauce is ready. Add milk to wheat bran, mix well and let it sit for 10 minutes, so that the wheat bran will soften a little. In another bowl, mix together apple sauce, brown sugar (I used powdered jaggery), vanilla essence and egg. Mix well. Add the above mixture to the wheat bran and mix well with a wire whisk. Add sifted flour mixture and mix until combined. Fold in blueberries. Bake in a preheated oven for 15-20 minutes or until a toothpick inserted in the center of a muffin comes out clean. Note - You can use all purpose flour instead of whole wheat flour or you can use 1/4 cup wheat flour +1/4 cup all purpose flour. I have used dried blueberries for making these bran muffins. You can use fresh blueberries. Surely will try this. I eat scones with bran and apples. They taste yummy. Btw how many apples should I use to get 1/4 cup sauce? One apple is more than sufficient. How can I make this eggless ?